Escarchas fell like snow during Mass, Venezuela, Carrizal. January 19, 2004 - Reported in [Spirit Daily.com] online newspaper. There are many alleged manifestations in our time, and so little time to discern them all. This is a constant theme as we try to sort through the avalanche of miraculous claims. And we try because miracles are as important today as they always have been, confirming the supernatural nature of our faith. Do we absolutely need them? No. We need faith. But they are granted by God to confirm the nature of this struggle called life -- and when they are good, when they are not imagined or conjured or a deception from the dark side, they do just that: propel us to yet greater faith and contact with the eternal. One thing we frequently hear about are inexplicable exudations -- that is, oil that reputedly flows from various objects. These reports come on a weekly basis. Mainly it's statues, but now we have been sent medals -- of the Sacred Heart, of Divine Mercy, of St. Benedict -- that are also said to have exuded an oily substance. 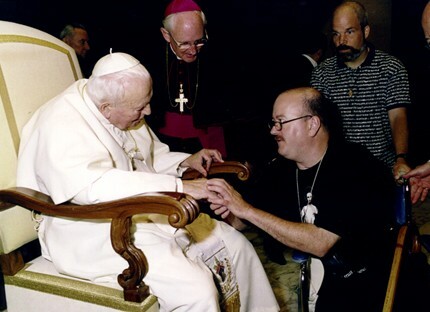 These were mailed by Allan Weilert (above, with Pope), a former Franciscan friar and now a chiropractor from Andover, Kansas, who first encountered the phenomenon last December 15 after receiving exuding items from a friend in Nebraska. The man is both a psychotherapist and a deacon. Like many, he wants to remain anonymous for fear of ridicule. "On a private retreat five years ago, he visited one of the convents established by St. Elizabeth Ann Seton," says Dr. Weilert. "The sisters who lived there gave him a miraculous medal that was apparently touched to a relic of Mother Seton. Upon his return home, he discovered that his shirt pocket which had held the medal was wet; the medal had oozed oil. It still exudes oil today, as do a number of sacramentals placed on his nightstand near this medal. The first items to exude oil in my home were sent to me from that friend. Other blessed articles belonging to me began to oil -- some immediately -- after being placed near ones already oozing this substance." According to Weilert, who has founded a new community dedicated to Divine Mercy and who once worked as co-director for the Healing Ministry of the Franciscan School of Evangelization in Southfield, Michigan, he began placing medals by the hundreds around the original ones he was sent and many of those have now exhibited what is best described as an oily film, along with a heavenly fragrance. "It is a colorless, non-staining, and fragrant oil which seems to accumulate over time on either one or both sides of a medal," he asserts. "A few other items such as statues, crucifixes, and rosaries placed near these medals have also exhibited signs of oiling." It was Weilert's discernment that if God could make water gush from a rock (for the Israelites), why not oil from metal? He emphasizes that the medals were blessed prior to exudation. Could it be a sign to wear medals as protection in these turbulent times? "I've been around a while, and I've never seen anything quite like this," he says. "I bought medals to give people and I've personally seen a thousand-plus ooze oil. They don't drip. They just have this film on them. Some have more than others. For example a statue in the clinic has so much oil at times that it's hard to hold it. But it doesn't puddle. If I put it in a dish it wouldn't collect. And the fragrance is another variable. If someone sprayed perfume, it would fade away, but this comes and goes." Is this good? Is it from God? Each of us must discern in prayer, and of course use the faculties of observation. Why oil? In Weilert's view: "I think it's a symbol of the Holy Spirit. Oil is a healing balm, scripturally based. I think the Holy Spirit is doing this to wake us up. I anoint people with oil that comes from these objects and its a great source of consolation. I've given the medals even to Protestants. I tell them to put them next to a crucifix in their homes and they come back and report that it's oozing oil. They're amazed." Weilert, 44, has trained hundreds of laity in the principles of healing prayer and has held healing services around the United States and abroad. In addition, he launched Catholics United for the Poor, a non-profit fundraising organization assisting urban ministries among the poor of Cincinnati, Ohio. Allan also designed and implemented a parish-based adult spirituality program, the Spiritual Life Center, at Our Lady of Guadalupe Church in Galveston, Texas, and has been on five pilgrimages to the Church-approved site of Betania in Venezuela. As usual, we offer this for your prayerful discernment. As with healers, we always urge prayer before contact with any allegedly miraculous object. What percentage exude? "They all get the film, but some get more like Benedictine medals and Miraculous Medals," he claims. "But I have seen every sacramental I can think of ooze the 'oil.' It's a very humble manifestation because it doesn't drip. It seems like it's oil, but it doesn't have the properties of oil in that it doesn't stain. It doesn't absorb in things. We call it 'oil' because it's what it seems closest to. Oil is a symbol of the Holy Spirit's pervasive and powerful Presence.""